27" flat-panel LCD is great for a wide range of tasks. Super thin, 27" flat-panel LCD monitor offers crisp, vibrant view from almost any angle. Features Technicolor Color Certification for true-to-life color. Bezel-less display provides an ultra-wide viewing experience provides for seamless multi-monitor set-ups. 178° horizontal viewing angle offers a great view from almost anywhere in the room. IPS technology ensures multiple viewers can clearly see the screen. 1920 x 1080 full HD resolution provides sharp, crisp visuals. 7ms G to G with overdrive response time allows pixels to change colors quickly. User control OSD settings allow for user-preferred settings can be saved with the HP MyDisplay software. HDMI and VGA interfaces for simple connectivity. HDMI connectivity requires an HDMI cable (sold separately). Our thinnest LCD display yet1 has a sleek design that's easy on the eyes. And the crisp, vibrant view from almost any angle comes at an ultra-affordable price. With ultra-wide viewing angles and vivid 1920 x 10802 resolution, this edge-to-edge display delivers an expansive entertainment experience for seamless multiple display setups. HP Enhance+ resolution improves image quality with advanced noise reduction for crisper, cleaner images. By reducing overexposure, this advanced noise filter amplifies your images for crisper photos, videos and games. HP My Display Smart software also lets you partition your screen so that multiple application windows can be open at the same time, and even saves user-preferred settings for any easy startup. The reflectiveness typical with glossy screen surfaces is appreciably reduced with the Low Haze screen enhancement, without losing clarity and contrast of screen imagery. 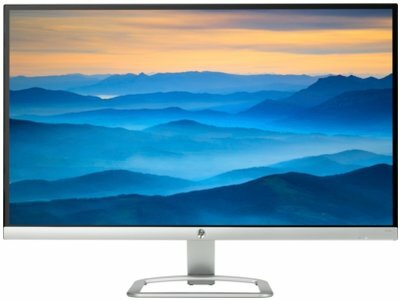 Do the environment—and your wallet—a favor when you use the HP 27er 27-inch Display. It meets strict energy-efficiency guidelines and helps reduce your carbon footprint. Looks great, works great at a great price! MP77: The unit has all the connections you need for myriad monitor functions. jayme: picture perfect , 27 er is a good size to play movies videos image looks fantastic so real and clear and colors excellent .. i recommend this product ..
Chum46: Nice wide screen, crisp picture, colors are great, easy to set up. 1 6.6 mm at its thinnest point.